I would like to thank Dave Hamilton for his excellent customer service. I was helping my mother look for a new vehicle. The very second we stepped on the lot he was there to greet us and answer all of our questions. He found the right vehicle and took us out for a drive right away. After browsing for a bit she decided to go with a 2014 equinox. At closing, we needed a cheque for the purchase price and we couldn’t do any sort of transfer, it has been a while since we purchased a car. We were not from the area and needed a bank. Of course, at that moment there was no service on the smartphone to check Google Maps to find a bank close by. So Dave gave us a ride in his new Silverado to Belle River so we could finish the transaction. He knew where it was and decided to save us some time and prevent us from getting lost. I do not know many people who would go to such lengths to complete a sale. His customer service is top notch, as well as the rest of the team at that dealership. Everyone was very friendly there and we would also like to thank Richard Coss in financial services for all his help too. He put together a good deal on the vehicle and we all laughed and joked around most of the time. Usually, you do not get to be yourself during business transactions, everyone is too serious. It was a nice change. I would recommend the dealership to anyone. From what I have seen they will do just about anything to help you get into a new vehicle. 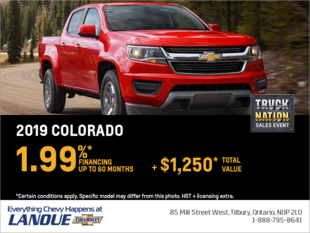 Go take a trip to Tilbury and get out of the city, it is nice to get away and they treat you better than the other dealerships in Windsor. Thanks for everything and she loves the new vehicle. She is already getting compliments on it.